There is something of ancient Rome about this – the crowd revelling in drink and drug fuelled chanting and dance ready to crown their leader on the dais of the high temple. No anti-democratic protests today- You can't be buggering about smashing the system when there's a a middle-class music festival to attend. Of course the great irony in all this is that the young people at Glastonbury will almost certainly view themselves as marginalised and down trodden martyrs, ever silenced in their battle against oppression. Many will likely have little or no sense of what an immense privilege it is to be able to devote their summer days to hedonistic abandon rather than worrying about getting blown up for their country – something that will be on the minds of many of those attending Armed Forces Day events; whom the Glastonbury crowd probably view as the violent enforcers of a ruling elite that must be destroyed. The re-emergence of socialism as a mass political force is causing genuine terror in Britain's elite circles. Superb. 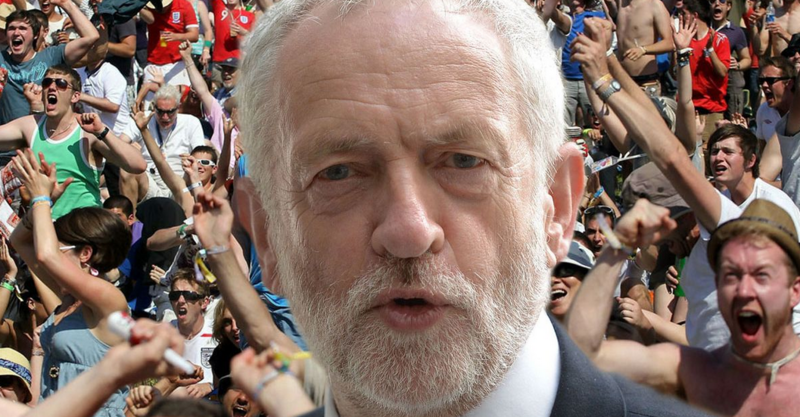 Of course all the Corbyn worship must feel absolutely great – even without the drugs. The Festival environment is the ultimate echo-chamber-come-hugbox: large numbers of trendy young people all affirming each other’s beliefs and nobody to dare challenge them to defend their ideas or ask them to think about economic realities, the catastrophic failure of 20th Century socialist and Communist experiments, or the dangerous reality that their leader actually views Castro as a champion of social justice. Who wouldn’t want to be in an environment where their favourite rock stars are affirming their opinions and being rude about their political opponents?